My mother passed away recently, and we were left with several of her plants. One seems to be a succulent that I am trying to identify so that I can take care of it better. I have included three photos which are hopefully of high enough quality. The plant itself has fairly woody main branches, which quickly fan out into thinner branches that seem to be almost composed entirely of the oddly-shaped leaves. I don't recall seeing the plant flower before, but my memory is not so good on that. In a way, it is almost a weeping-style plant. I apologize for not having more details, but I am fairly new to caring after plants. Please let me know if any more information is needed. It has lasted many years so far, and I'd like to be able to keep it alive for many more to come. The watering and fertilizing requirements are especially important to me. Thank you very much for your time. Hi Matthew, sorry for your loss. Your Mom has left you a "legacy plant" to remember her by, and this one is a common plant that is passed through the generations. As long lived plants, these are amazingly easy to take care of, providing you meet a few criteria. To see the bloom cycle, you will need to find a bright but not sunny spot, and then don't move it from now until after it flowers. You will be amazed at how many blooms it has if it's received a summer outside or at least a bit of dormancy, then cooler nights. This sets the buds. 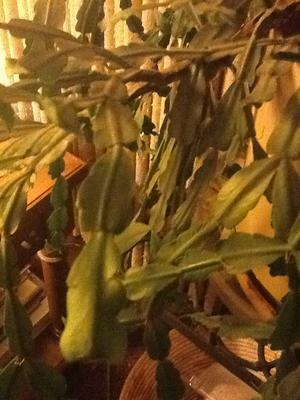 Now for the identification part: What you have so fortunately received is a Schlumbergera, a not so nice name for the Christmas Cactus. There are several other plants that go by the name of Holiday Cactus, but they all need the same or similar care. 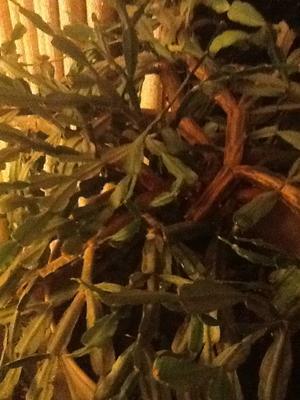 See the page on epiphytes, which is what this is. Best of luck with your Legacy Plant!